Received her undergraduate diploma from Dokuz Eylül University Buca School of Educational Sciences, Department of Art Training. Served as a teacher at the University as well as various other institutes, and also worked as a graphic designer. Ever since 1969, she has been organizing personal exhibitions and taking part in mixed art shows both locally as well as abroad. Akdeniz also has received prizes in her own field. In an article by Fırat Arapoğlu drafted on the works of Nadide Akdeniz, he assesses her works as landscapes far away from mimesis, bearing excessively ironic elements. It is possible to consider the works of the artist as fictionalized landscape, because her compositions do not encompass traditional narration. By means of her plastic statement approaching pop art, she refers to a world beyond the perception of reality. From another point of view, the symbols brought together on her canvases are reminders regarding alienation, being left outside life. In the artificial world we have created, she causes the audience to encounter with deprivation of reality infiltrating our subconscious. In her compositions, she frequently causes the question “why?” to be asked and most of the time her works are the exact answer to the question so caused to be asked. Why? Because all of us are transformed into objects appearing to be alive and could possibly be looking indifferently to whatever is happening around us. After its participation in Scope Miami Art Show, Çağla Cabaoğlu Gallery took part in Scope New York Art Show between March 02 and 06, 2017, with an installation titled “Istanbul’s Cabinet of Curiosities”, comprising of the works of 32 contemporary Turkish artists. Following Miami Scope Art Show, Çağla Cabaoğlu Gallery introduced this time a mural collage installation of multidisciplinary works inspired by the city, stepping forth from the cultural layers of Istanbul. With this exhibition Çağla Cabaoğlu Gallery attracts attention to the relationship between Turkey’s contemporary art practices and Anatolian culture as the junction, intersection of civilizations throughout the ages as well as today’s world: thirty two artists from different generations, living and producing at varied geographies, nourished by their habitat, contemporary practices of art, Anatolia’s cultural heritage and their personal experiences. “Cabinet of Curiosities”, originated with the discovery impetus of the Renaissance, initially brought together items which were discrepant, amazing and heterodox. Then, re-introduced the eclectic structure posed within the framework of a homogeneous universe ranging from a collection to the idea and concept of a museum. Cabinet of Curiosities is a symbol of curiosity, research, and inquiry, propagating knowledge, prestige and new perspectives. Further to being a symbolic conveyance of the personal universe, a transformation of whatever belongs to the culture and accumulation of humanity. “Istanbul‘s Cabinet of Curiosities” concept is at the same time a suggestion regarding intercultural dialogue and transitivity. While the concept of Istanbul‘s Cabinet of Curiosities highlighted the movement of the culture over the trade routes of the Phoenicians from Istanbul to the Mediterranean and from there to South America, as well as the indicators of a process that signifies a dialogue with similarities and diversities, the project also remarks the productions of artists coming from different generations and geographies of Istanbul, which is an unusual and special world city composed of different cultural layers. Çağla Cabaoğlu Gallery generated this project through rare works of very specific artists selected from amongst the exclusive and setting sail on a new odyssey in pursuit of the historical accumulation. Following the footsteps of civilization ever since the Phoenicians, is reshaping Turkey’s artists living and creating in the 21st century in soils not too distant apart. And is bringing together the époque-integrated works of those artists impersonating such terra with the mutual language of the greater global terrain. 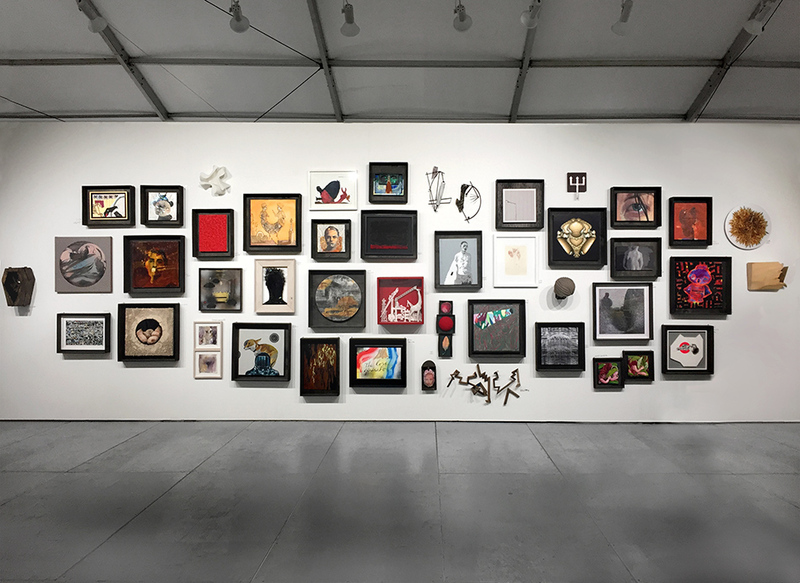 Çağla Cabaoğlu Gallery took part at Scope Miami Art Show between November 29 and December 04, 2016 with an installation of 9×3 m titled “Istanbul’s Cabinet of Curiosities”, comprising of the works of 42 contemporary Turkish artists.